A fun new twist on classic Potato Salad! This Creamy Italian Potato Salad is filled with spinach, pesto, tomatoes, roasted red peppers and Parmesan cheese, it’s perfect alongside grilled chicken or at any picnic! I’m sure I’ve mentioned this before, but let’s just assume you don’t actually read anything I write and so I’m going to say it again. I’m a little bit weird when it comes to dips, dressings and sauces. I like ketchup. And barbecue sauce, sweet and sour sauce, Thai sweet chili sauce. Mild salsa. And really any kind of pasta sauce. But mayo? Ick. Salad dressings? No way. Mustards, relishes, chimichurri? Nuh-uh. I am so Plain Jane that you might think it’s weird that here I am a work-from-home food blogger. But I don’t think so at all. In fact, I think that since I eat more like your 8-year-old children than most of you do, I have a really good grasp on how to get all that healthy stuff into them. I know all about sneaking in veggies and making healthier versions of classic comfort foods (like this Oven Fried Chicken or Healthier Homemade Hamburger Helper and its Slow Cooker Sister). The strange thing is, I actually really love potato salad come barbecue season. That’s right, the plain old mayo-loaded potato salad with hard-boiled eggs (another thing I “don’t like”) — I love the stuff. I do like it a touch on the salty side to mask the tangy-ness of the mayonnaise, but still, I thoroughly enjoy it. So when I was dreaming up what to make with my Little Potatoes from The Little Potato Company this month, I knew I needed another twist on Potato Salad. I already have this Warm Maple Bacon Potato Salad which has been so popular. Plus this BBQ Bacon Potato Salad and these Potato Salad Bites (so cute for a party!). Since we love Italian flavors, I decided to add some to a traditional potato salad — roasted red peppers, spinach, pesto (yes, one of the sauces I enjoy! ), Parmesean cheese, and grape tomatoes. I went somewhere between the classic mayo-loaded potato salad and a vinaigrette, because I wanted to keep a bit of the creaminess. If you prefer, you could swap out the mayo for Greek yogurt, keeping in mind that it will taste more like Greek yogurt and less like mayo (obvi). If you wanted to make the salad extra special, some crispy pancetta, prosciutto or any diced Italian deli meat would be a nice addition! I used a 1.5lb bag of Blushing Belles from The Little Potato Company for this Potato Salad, but any of the Little Potatoes would work just as well. Don’t bother washing or peeling them! Just quarter, boil, chill and toss with the dressing. Potato salads keep so well, so feel free to make it a couple days in advance! *This post is sponsored by The Little Potato Company as part of my ambassadorship with them. Thank you for supporting the brands that make The Recipe Rebel possible! A fun new twist on classic Potato Salad! 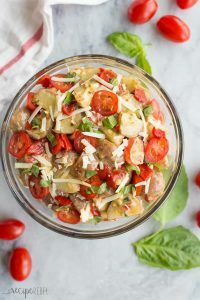 This Creamy Italian Potato Salad is filled with spinach, pesto, tomatoes, roasted red peppers and Parmesan cheese, it's perfect alongside grilled chicken or at any picnic! 1/2 cup shredded Parmesan cheese the real stuff! In a large pot, cover potatoes in cold water. Bring to a boil over medium high heat, and cook for 5-8 minutes, until tender. Drain, place in a large bowl, cover and refrigerate until cold. Yum! I like the Italian inspired flavors! I actually love mayo and don’t really understand not liking it! But I also love trying other potato salad versions and this one looks amazing. Love the pesto in it, that would be so good! Perfect for summer BBQ’s! I hate mayo like seriously I am not a fan of that stuff and that’s one reason I don’t like classic potato salads! But I am loving your version Ashley! Looks so delicious and full of flavor! I am not a big mayo fan either but I do love me some pesto so this lightened up potato salad is perfect 🙂 Looks so fresh and delicious and the Italian twist is such a great idea! Ashley, I’m with you on the mayo with some things but I LOVE condiments and chimichurri is my fave. . this potato salad looks amazing!!!!! 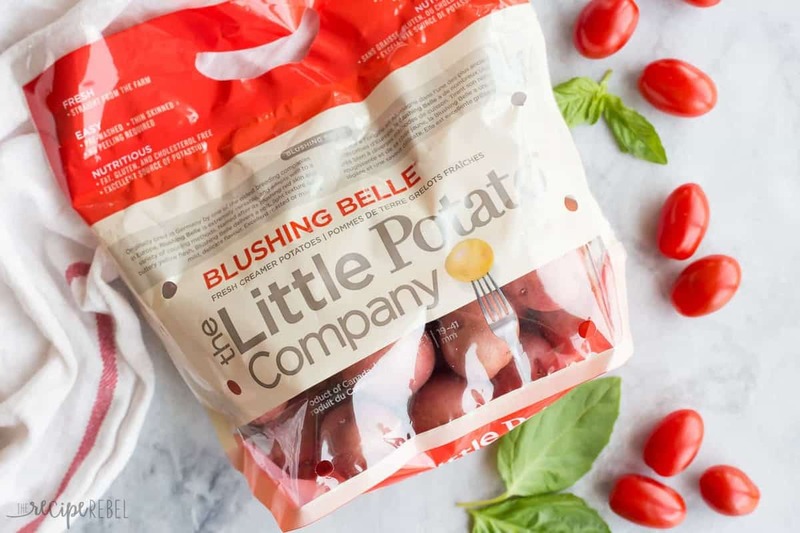 I’ll have to look for the blushing belles at my local grocery store. . they carry The Little Potato Company!!! You should try them Alice — I love them! They are so creamy! I am a bit of a condiment snob… Lol. I only like certain things! I’m weird about sauces and dips too. Mayo is definitely not my favorite, that’s for sure! That being said, I’m totally loving that this gorgeous potato salad uses a lot less than normally called for! I reaaaaaally just want to dive into my screen right now and grab all that summer goodness! Thanks Sarah! 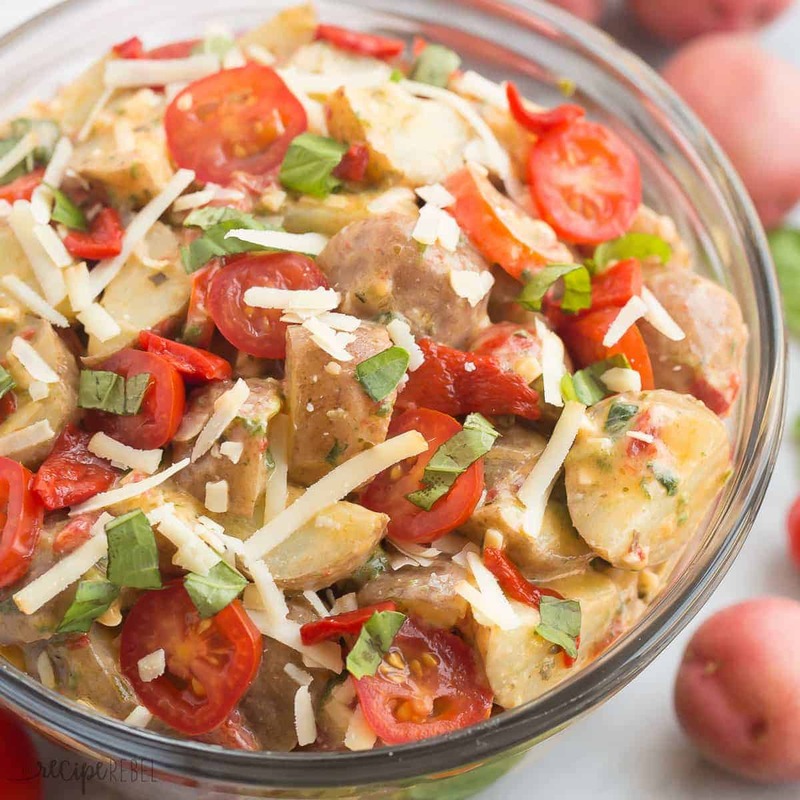 Potato salads are pretty much my favorite summer side! What a great flavor for potato salad! Love this! I like potato salads that are made with mayo or my grandmas which is made with sour cream instead. I don’t like miracle whip or mustard in my potato salad. 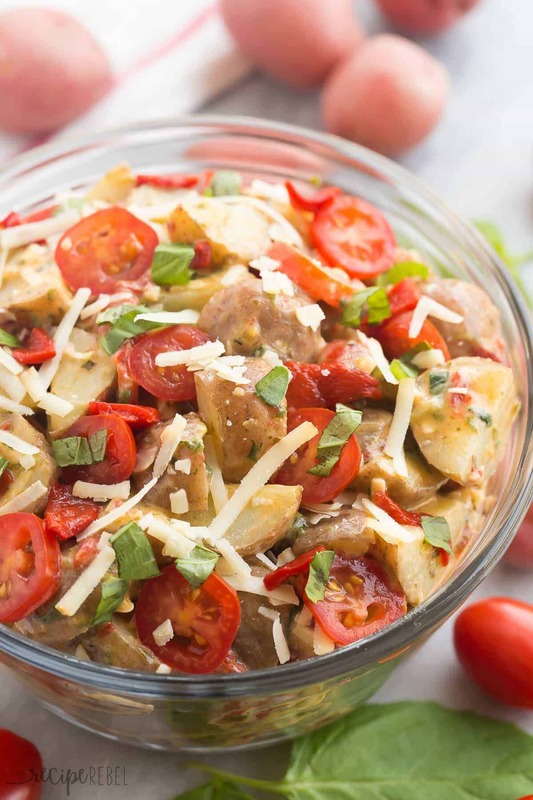 I love your flavor combo you have with this potato salad and it looks perfect for the summer!! I don’t like mayo either, especially when it’s thick and gloppy in potato salad! This is definitely not that, and I love the pesto. This is what potato salad should be like — fresh and perfect for summer! I tend to be pretty Plain Jane too when it comes to food, so I know how you feel! I do love mayo though and I always tend to go for the potato salads with mayo in them too. But I could definitely go for this one, I love the Italian twist! I love mayo, but I actually don’t like potato salads! I think it’s mostly because it’s usually made with miracle whip and mustard, which is a no-go for me (even though I like mustard, but hate miracle whip). This looks like my kind of salad! I love the garlic and pesto in here. Sounds so fresh and flavorful for the summer!